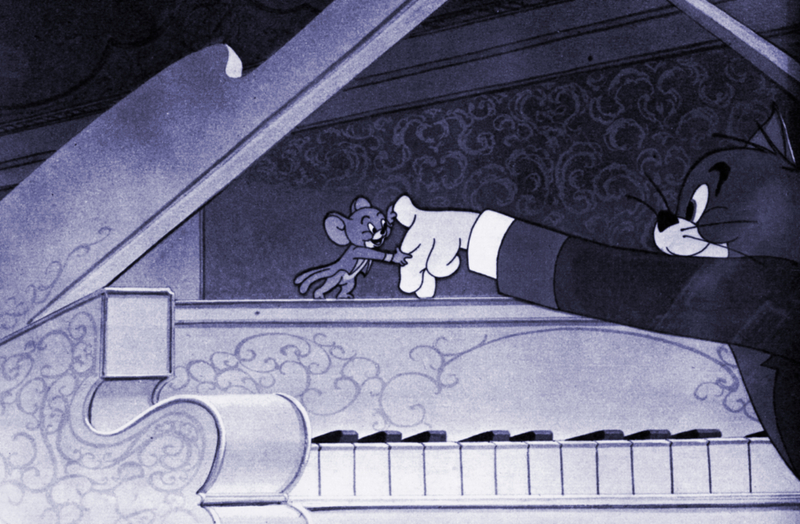 William Hanna and Joseph Barbera, the creators of the world-famous cat and mouse, Tom and Jerry, are veterans in the field of animated cartoons. Three years ago they branched out on their own under the banner of Hanna and Barbera Productions — they were formerly with M.-G.-M. for 20 years — located at the old Charlie Chaplin studio in Hollywood. 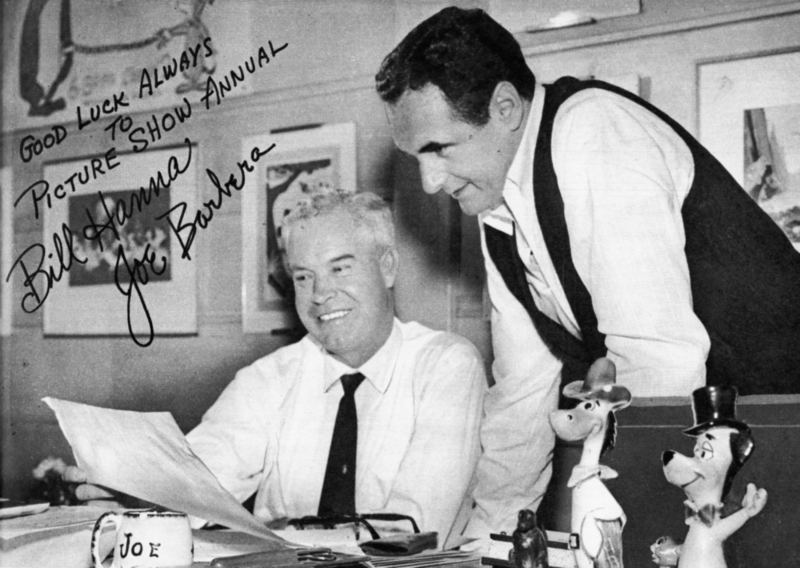 Oddly enough, neither William Hanna nor Joseph Barbera started his career in life as artist or cartoonist. Hanna, born in Melrose, New Mexico, studied engineering and journalism at the University of California. His first job as a structural engineer was for the building of the Pantages Theatre in Hollywood. After falling off a girder he decided to try his luck at another profession. Joseph Barbera, born in New York City, went to work as an accountant for the New York’s Trust Company. He was a dreamer and a doodler, a habit which was to launch him in a new career. After many tries of submitting cartoons to magazines he managed to sell one to Collier’s. Soon he became a regular contributor to such leading magazines as The New Yorker and Punch as well as Collier’s. 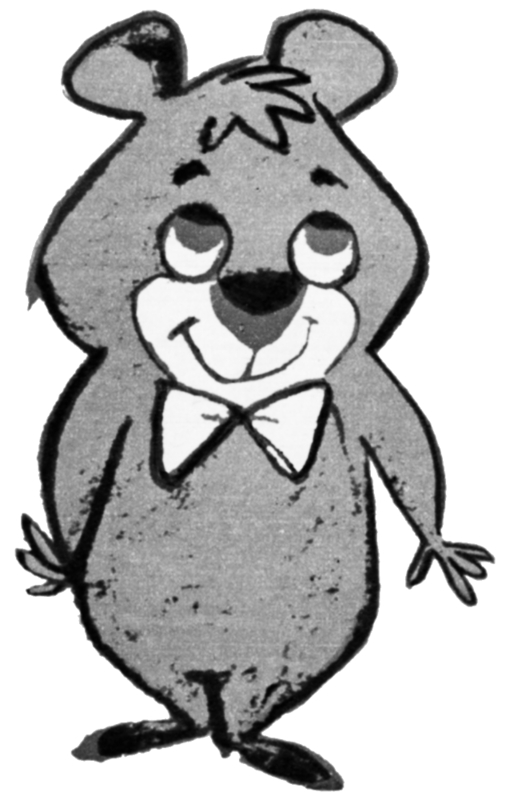 In 1937, Bill Hanna was hired by M.-G.-M. studios as a director and story man and Joe Barbera became an animator and writer at the same studio. As their first assignment the two men were told to create a fresh, new cartoon series for motion pictures. The result: Tom and Jerry. “Are Tom and Jerry modelled on any particular cat and mouse?” I asked. “On the M.-G.-M. backlot there was a whole colony of cats to keep down the population of rats. Although the studio supplied them with food, water and even milk, those cats were vicious and like wild animals. From them we got the idea of adding Butch, the alley cat. Butch’s counterpart was on the backlot, and this also is true of Tom. “Jerry, the mouse, was a little creature that turned up at our office from nowhere — I guess he was after scraps. We encouraged him to have the run of the office by putting titbits of cheese and other tasty morsels for him to nibble. We used to watch him for weeks in all his movements and antics. “When kittens were born to the alley cats the girls in the inking department mothered them and made pets of them. Here we added models for the behaviour of Tom and Jerry. During the 20 years’ tenure at M.-G.-M. the team turned out 125 adventures of the mischievous rodent and bungling feline, which won seven Academy Awards for the studio. It was expensive to produce these cartoons which cost about £13,000 [£275,000 in 2018’s money] for a seven-minute run. In 1957, with the motion picture business at an all-time low, M.-G.-M. decided to discontinue cartoon production for motion pictures and Hanna and Barbera were given release from their contracts. This proved to be the biggest break of their lives. Together they had perfected several techniques and ideas for producing cartoons for television which they submitted to various advertising agencies and film production companies. On 7th July 1957 the two men formed the Hanna and Barbera Productions and Screen Gems took over as distributors. Their first production was Ruff ‘n’ Reddy, a story about a frisky cat and a dimwitted dog, and went on an American network in 1957, followed by Huckleberry Hound, the saga of a canine Don Quixote, which is one of their most popular cartoons. It is estimated that it takes over 90 separate drawings to create a laugh movement or a total of 10,000 individual drawing frames to make up a half-hour cartoon enjoyment. Bill Hanna and Joe Barbera say: “We think the popularity of our cartoons lies in providing psychological release for all human beings of all ages. No one gets hurt despite clobbering and binding situations. “We have tried to give the audience characters which they can identify with themselves—then follow up with wild antics impossible to duplicate in real life. William Hanna is married and resides in North Hollywood with his wife and their two children, Bonnie, 18, and David, 21. Joseph Barbera and his wife live in West Los Angeles. They have three children, Lynn, 21, Jayne, 18, and Neal, 15. However, were not most of the “Tom and Jerry” cartoons broadcast on BBC-1 not from Hanna-Barbera but from the Chuck Jones team of Sib Tower 12 Productions? 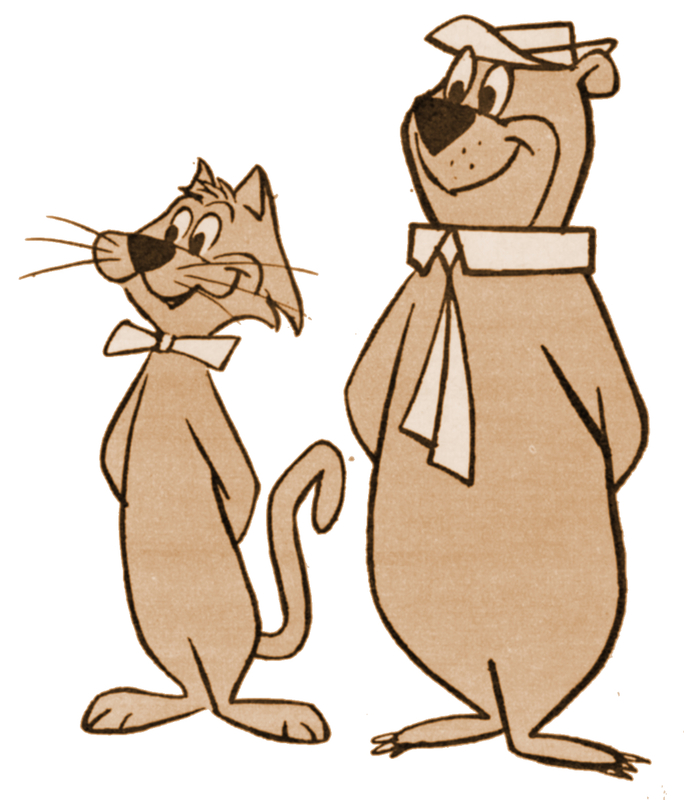 When the name Hanna-Barbera is mentioned, the cartoons most associated with the production name are Huckleberry Hound, Yogi Bear, The Flintstones, The Jetsons, and Top Cat (the latter always being deliberatly mis-tiitled as “Boss Cat” in the weekly BBC Radio Times magazine). Nutty Slack, the BBC had to refer to Top Cat as “Boss Cat” to avoid legal action regarding a brand of cat food in the UK called Top Cat. Apparently, it would have violated their then strict rules about advertising? That’s what I was told as a child anyway, when I questioned the “Boss Cat” reference one day when watching telly with my fathet.